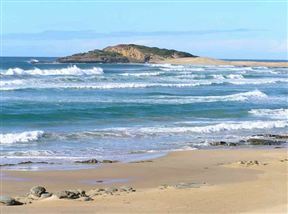 Primarily a surfing and diving beach, Cove Rock is not popular for swimming. It is a great place for whale spotting from the high vantage points and for watching seabirds nesting in the striking sandstone formations. There are fantastic fishing spots and it’s a great beach for soaking up the natural beauty and chilling. Keen hikers will enjoy the hour-long walk along the coast from Lagoon Valley. Cove Rock is 0km from the centre of Cove Rock , the nearest airport 4.1km (East London Airport).